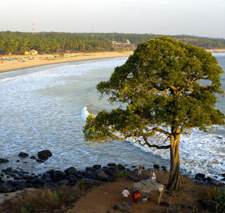 Kasaragod is known as land of Gods, forts, rivers, hills and beautiful beaches. Kasaragod displays a variety of styles in architecture, the unique style of the Madhur Mahaganapathy Temple, the typical Kerala style of the historic Malik Deenar Great Juma Masjid and so on speak volumes about the rich cultural heritage of the region. Spectacular pageants of Theyyam, Yakshagana, Kumbla (buffalo race), Poorakkali, Kolkali etc enchant visitors. Kasaragod is the Northern most part and district of Kerala. This hitherto deserted district has gained importance from the recent time when it became the window to the Western and Northern parts of India after the introduction of Konkan Railways. The culture here is a blend of Malayalees and that of Mangaloorians. Malayalam, Kannada and Tulu are spoken here or rather a mixture of all these. The beach is very attractive, especially the fort Bekal. Bekal fort which is the largest and best preserved in Kerala is an important tourist spot. Adjoining Chandragiri fort is also very famous. Kasaragod is world renowned for its coir and handloom industries. Fishing is a prime source of livelihood. Bekal Fort: (16 km south of Kasaragod on the national highway) The 300 year old Bekal fort is one of the largest and best preserved forts in Kerala. This imposing circular structure of laterite rises 130 feet above sea level and stands on a 35 acres head land that runs into the Arabian Sea. Bekal Fort Beach: (1 km from Bekal Fort) This shallow beach offers a spectacular view of the fort and has ample facilities for recreation and relaxation. Bekal Hole Aqua Park: (1 km from Bekal Fort) The only one of its kinds in Northern Kerala, this unique Aqua park provides water sport facilities like pedal boats and water cycles. Manjeswaram: A number of temples and fifteen mosques make this cashew growing town a prominent pilgrim centre. The Memorial of the late Govinda Pai, the grand Patriarch of Kannada literature, is also located in Manjeswaram. Anandasram: (15 km from Bekal) This internationally renowned spiritual centre founded by Swami Ramdas in 1939, offers a quiet, peaceful ambience best suited for meditation and spiritual studies. Mahalingeswara Temple, Adoor: (45 km from Kasaragod) Located in wooded surroundings on the southern banks of the River Payaswini, this ancient Siva Temple contains a sanskrit inscription in Kannada script which has been ascribed to Western Chalukya King Kirthivarman II (745-755 AD). Malik Deenar Mosque: The historic Malik Deener Juma Masjid built in the typical Kerala style is believed to have been founded by Malik Ibin Dinar. The Juma Masjid, which is one of the best kept and most attractive in the district is located at Thalankara. Tejaswini/Valiyaparamba Backwaters: (30 km from Bekal) This is one of the most scenic backwater stretches in Kerala. Fed by Four rivers and dotted with numerous little islands, this much favoured destination offers enchanting boat cruises. Chandragiri: Situated on the banks of Chandragiri River, this town is known for its large 17th century fort built by Sivappa Naik of Bedanore. The Chandragiri Fort, one of a chain of forts built by the same ruler, offers a breathtaking view of the river and Arabian Sea. Jain Temples: There are two old Jain Bastis at Bengara Manjeswar on the Southern bank of Manjeswar River. Cheruvathur:This is the home of the illustrious poets and scholars of Kuttamath. The ruins of a Dutch Fort built in the 18th century can be found in the Veeramala Hills. Mother Dolorus Church: The hundred years old Roman Catholic Church is built in the Gothic Style. Our lady of sorrows church constructed in 1890, is the oldest in the district. Kanwatheertha Beach: (3 km from Manjeswaram) A large swimming pool like formation of the sea on the vast beach is the main attraction. Kanhangad /Hosdurg Fort: This is renowned for its chain of forts built by Somashekhara Nayak of Ikkeri dynasty and also for the Nithyanandashram, an internationally recognized spiritual centre. Madiyankulam Durga Temple: This Bhadhrakali temple at Kanhangad in Hosdurg is famed for the Bhutha dance performed in connection with the annual festivals. Kottancherry : (30 km north east of Kanhangad) This place bears great resemblance to the scenic beauty of Kodaikanal. The rain forest near Konnakkad is ideal for trekking. Ranipuram: Situated 750 meters above sea level, Ranipuram is famous for its trekking trails and varied vegetation like evergreen shola woods, monsoon forests and grasslands. Formerly known as Madathumala, Ranipuram in its natural beauty is comparable to Ooty. Trikkaripur: The old seat of the Thazhekattu Mana, Trikkaripur is the home town of TS Thirumumb, poet and freedom fighter and Guru Chandu Panikkar, the famous Kathakali artist. Edneer Mutt: (10 km Kasaragod) The Mutt of Edneer renowned as a seat of art and learning belong to the Sankaracharya tradition. Possadigumpe:(18 km east of Mangalpady in Dharmathadka) This is an ideal picnic spot, located on a hillock 1060 feet above sea level. Tulur Vanam: (4 km east of Panathur) Tulur Vanam is also known as Kekulom, the eastern place. The temple here is consecrated to Kshetrapalan and Bhagavathi. CPCRI:The Central Plantation Crops and Research Institute serves as a national forum for improving the genetic potential of plantation crops, to conduct basic and applied research on various aspects of these crops, to produce genetically superior planting materials for coconut, areca nut, spices and cashew nut. Pandiyan Kallu: A rock rising in the sea about 2 km from the Trikkannad Temple, Pandiyankallu is an ideal spot for adventurous swimmers. Legend has it that ship of one of the Pandiya Kings who attacked Trikkannad Temple was converted into a rock. Ananthapuram Lake Temple: (30 km from Bekal) This 9th century temple is the only lake temple in Kerala and is the original abode of Ananthapadmanabha, the deity of Sree Padmnabha Swami Temple, Thiruvananthapuram. Kappil Beach: (6 km from Bekal Fort) Remote and secluded this beach is fast becoming a major tourist attraction. Madhur Temple: (8 km North of Kasarasgod town) The Srimad Anantheswara Vinayaka Temple, with its rich architecture and copper plate roofing, rises majestically against the beautiful landscape of the Madhuvahini River. Nileswaram Palace: The cultural centre of the district, this was the seat of the Nileswar Rajas. The Nileswaram palace today functions as the folklore centre of the Department of Archaeology.